Listen now as Steve Harper explains the power of The Ripple Effect! I bet you want to know what Rippling is? Or maybe even how to Ripple? You are going to love this interview with Steve Harper. Our conversation is all about how, growing up shy and introverted, he learned to build relationships with people. It wasn't easy. But he came upon this idea about Rippling and it changed his entire life. So what is Rippling? The concept that one connection leads to the next to the next, and then ripples well past where it began, changing people's lives. As Steve tells us, every action has a reaction. The power of Rippling is very much like that. We take actions on behalf of other people without the expectation of anything in return, and then those Ripples often Ripple back to us in unexpected ways. For companies, Rippling is a form of engagement which turns ordinary customers into evangelists for your product or service. A serial entrepreneur, professional speaker, author and leading business strategist, Steve has successfully uncovered the secret to creating powerful long-lasting connections and their impact on one’s personal and professional life. He has transitioned his years of business experience and unyielding customer focus into a successful consulting practice appropriately called The Ripple Effect, named after his successful book by the same title. Today, Steve has become one of the most sought-after speakers and business strategists, an expert on the power of deepening and strengthening personal connections through the process of Rippling. His unique and refreshing approach to how and why individuals, organizations and even our society can and must reach outside the box to connect is literally changing lives and impacting corporate bottom lines. 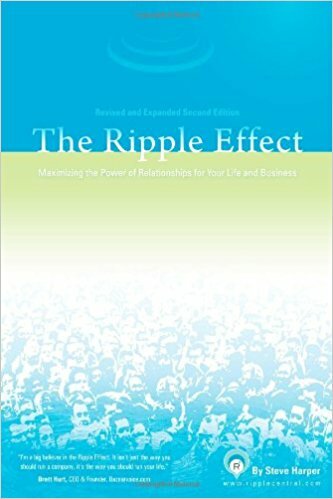 Steve's book: "The Ripple Effect"